When exploring Structure Summary pages on the RCSB PDB website, you will notice images and coordinate files for the "Biological Assembly" and the "Asymmetric Unit". In many PDB entries, these are the same. However, for some entries (mostly those solved by X-ray crystallography), you may notice a difference between the asymmetric unit and the biological assembly. If you have wondered whether the coordinates for the given structure represent the biologically-relevant assembly, read on to find out more about the meaning of these terms and how the corresponding data are archived in the files. The primary coordinate file of a crystal structure typically contains just one crystal asymmetric unit and may or may not be the same as the biological assembly. This introduction describes the terms asymmetric unit and biological assembly, lists where information about these can be found in various files formats (PDB and mmCIF), and explains how biological assembly files in the PDB archive are derived. Since the PDBML format is derived from the mmCIF format file, a separate discussion of this format is not included here. 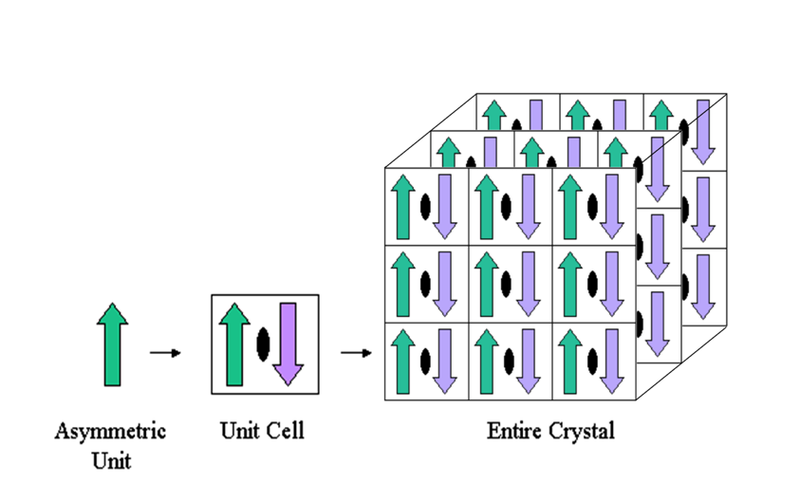 The asymmetric unit is the smallest portion of a crystal structure to which symmetry operations can be applied in order to generate the complete unit cell (the crystal repeating unit). Symmetry operations most common to crystals of biological macromolecules are rotations, translations and screw axes (combinations of rotation and translation). Application of crystallographic symmetry operations to an asymmetric unit yields one unit cell that when translated in three dimensions makes up the entire crystal. Below is a simple example. The asymmetric unit (green upward arrow) is rotated 180 degrees about a two-fold crystallographic symmetry axis (black oval) to produce a second copy (purple downward arrow). Together the two arrows comprise the unit cell. The unit cell is then translationally repeated in three directions to make a 3-dimensional crystal. The asymmetric unit contains the unique part of a crystal structure. 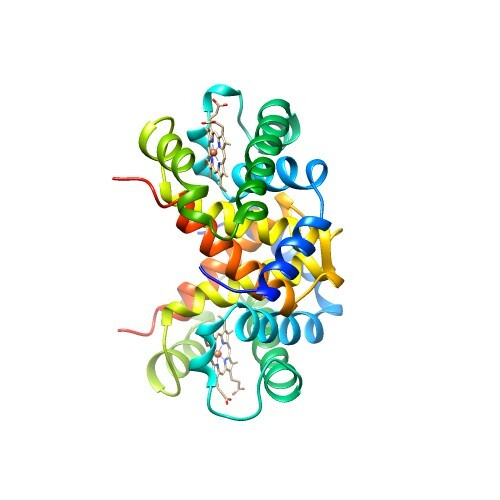 It is used by the crystallographer to refine the coordinates of the structure against the experimental data and may not necessarily represent a whole biologically functional assembly. Copies of the macromolecule or complex within a crystal unit cell have identical conformations and occupy symmetry-related positions. As a result, the biological assembly may either be composed of one copy of the macromolecule/complex or it may be composed of two or more symmetry related molecules/complexes coming together to form a larger assembly. Copies of the macromolecule or complex take on slightly different conformations and occupy unique positions in the crystal asymmetric unit. As a result, each of the different positions of the macromolecule/complex may correspond to structurally similar but not identical biological assemblies. 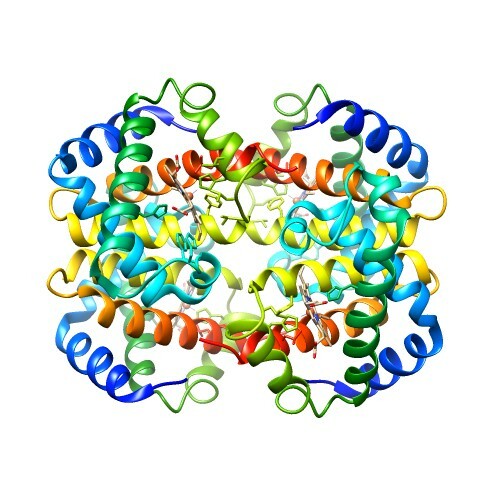 Entry 2hhb contains one hemoglobin molecule (4 chains) in the asymmetric unit. 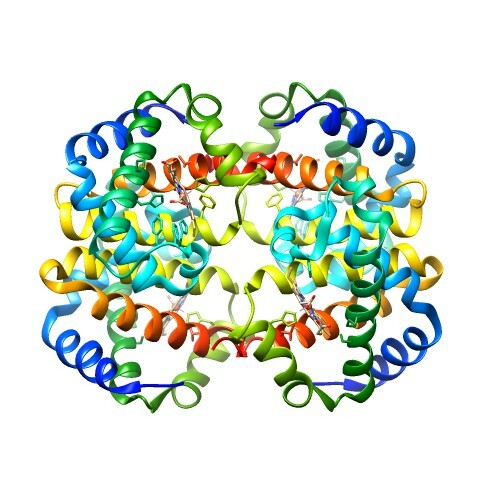 Entry 1out contains half a hemoglobin molecule (2 chains) in the asymmetric unit. 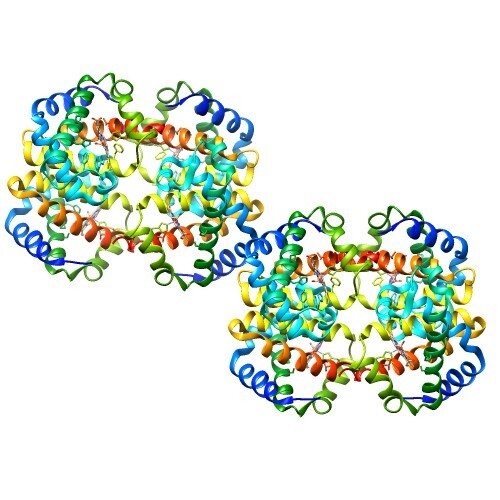 A crystallographic two-fold axis generates the other 2 chains of the hemoglobin molecule. 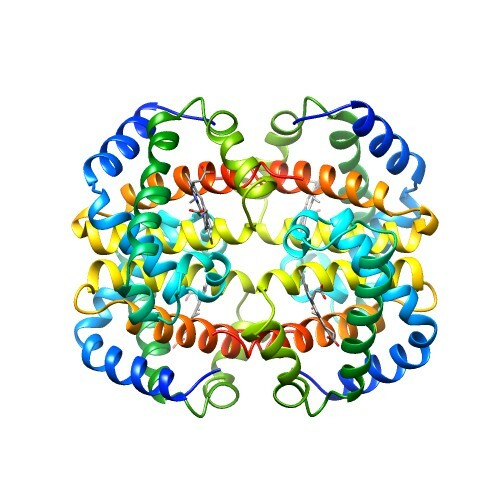 Entry 1hv4 contains two hemoglobin molecules (8 chains) in the asymmetric unit. The biological assembly (also sometimes referred to as the biological unit) is the macromolecular assembly that has either been shown to be or is believed to be the functional form of the molecule. 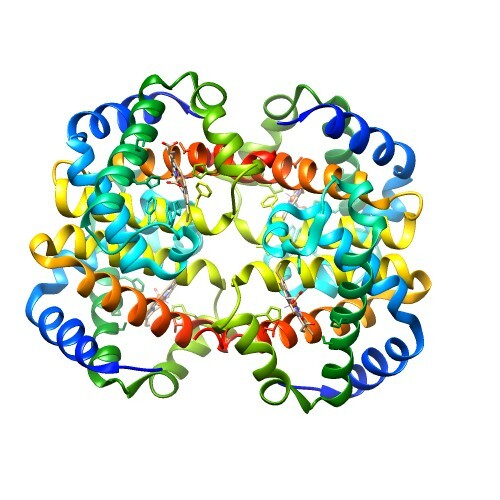 For example, the functional form of hemoglobin has four chains. In entry 2hhb, the biological assembly is equivalent to the asymmetric unit. In entry 1out the biological assembly includes two asymmetric units. In entry 1hv4 the biological assembly is one-half of the asymmetric unit. No operations are necessary. Application of a crystallographic symmetry operation (a 180 rotation around a crystallographic two-fold axis) produces the complete biological assembly. The entry contains two structurally similar, but not entirely identical copies of the biological assembly within the crystal asymmetric unit. A biological assembly is not always a multi-chain grouping. For example, the functional unit of dihydrofolate reductase (shown here from entry 7dfr) is a monomer and the biological assembly also contains only one chain. A molecule may occasionally appear to be multimeric within a crystal based on crystal packing. However, there may be no evidence or biological relevance in support of a multimeric state in solution. When the entry is processed, all probable assemblies are computed based on the buried surface area and interaction energies. These predicted assemblies may or may not coincide with what the author considers to be the biologically relevant assembly for the molecule. The biological assemblies reported in the entry include a remark to explain whether it is "author provided", "software determined" or both. The asymmetric unit is a monomer. These are the deposited coordinates. The "author provided" and "software determined" biological assemblies are both monomers. 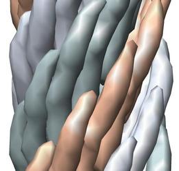 The software, PISA, predicts that this molecule may also form a dimer. Hence the second biological assembly is only "software determined". In the web file download options, various versions of the biological assembly files are marked as (A) for author provided and (S) for software determined. Viral capsid crystal structures often contain only part of the crystal asymmetric unit. These entries require non-crystallographic symmetry operators to be applied to the deposited coordinates in order to generate the crystal asymmetric unit. The deposited coordinates represent 1 icosahedral asymmetric unit. This unit is represented by ribbons in all views. The crystal asymmetric unit is pentameric. The biological assembly is an icosahedron (as show above). 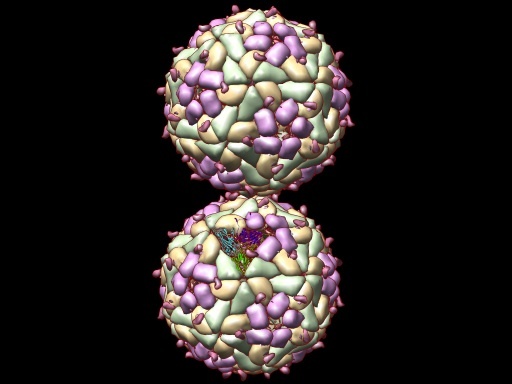 The complete crystal unit cell contains 2 icosahedral virus particles. 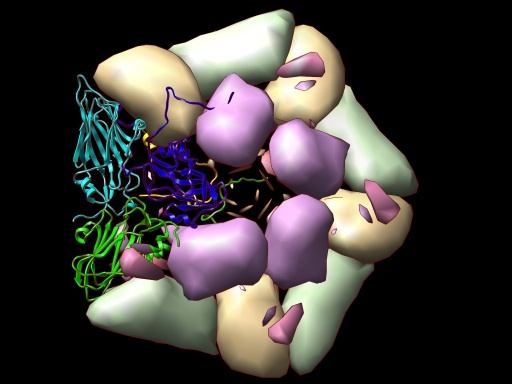 In addition to crystal structures of virus capsids, the PDB archive holds virus structures determined by electron microscopy, fiber diffraction and solid state NMR. 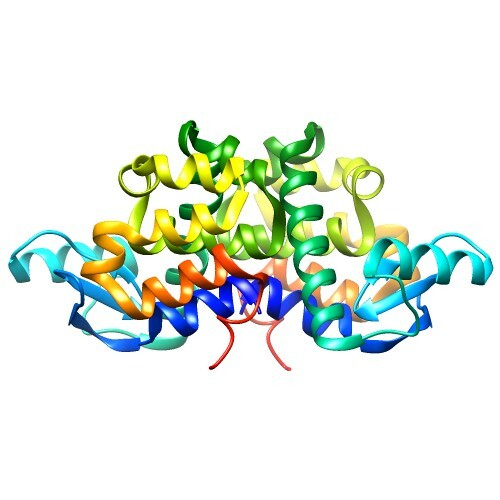 In all cases of assemblies with regular point or helical symmetry, the PDB entry includes the coordinates of the repeating unit and the appropriate crystallographic and/or non-crystallographic symmetry operators required to generate the biological assembly. 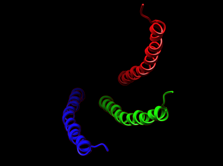 For example, in the fiber diffraction structure of filamentous bacteriophage PF1, in entry 1ql2, the asymmetric unit contains 3 helices while the biological assembly is a helical virus, generated by applying matrices that represent the helical rotation and translation. In mmCIF format files, details about the structural elements that form each biological assembly are found in the pdbx_struct_assembly, pdbx_struct_assembly_gen and pdbx_struct_oper_list categories. The first two categories describe the generation of each biological assembly for the structure and present details about it, while the third one lists the transformations required for generating the biological assembly. The category pdbx_struct_assembly_gen links the transformations in pdbx_struct_oper_list with the chains to which they apply (note that the chain identifiers are the asym_ids used throughout the mmCIF file). Any specific biological assembly related remarks from the authors are stored in the struct_biol category. 1 'ABSA (A^2)' 3840 ? 1 'SSA (A^2)' 19310 ? In the pdbx_struct_oper_list category, the 1_555 notation is crystallographic shorthand to describe a particular symmetry operator (the number before the underscore) and any required translation (the three numbers following the underscore). Symmetry operators are defined by the space group and the translations are given for the three-unit cell axis (a, b, and c) where 5 indicates no translation and numbers higher or lower signify the number of unit cell translations in the positive or negative direction. For example, 4_565 indicates the use of symmetry operator 4 followed by a one-unit cell translation in the positive b direction. In the case of viruses and other complex assemblies with non-crystallographic symmetry, the biological assembly is more complex and may also be composed of many sub-assemblies. The data items in pdbx_struct_assembly list all the possible sub-assemblies, while those in _pdbx_struct_assembly_gen list the process of generating these assemblies. The struct_oper_list category gives a list of matrices (both crystallographic and non-crystallographic operators) required to create the various biological assemblies from the given coordinate file. This list also includes the matrices: "P" to transform the deposited coordinates to a standard point frame, and "X0" which is the transformation required to move the deposited coordinates into the crystal frame2. Thus, the deposited coordinates may be transferred to either the standard or crystal frames using these matrices. The data category _pdbx_struct_oper_list is used for all viruses and holds the matrices for BIOMT records that appear in REMARK 350 of the PDB format file. In cases where the assembly definition listed in struct_oper_list requires sequential multiplication of matrices (example entry 1m4x), the pdbx_struct_oper provides the final list of matrices which are applied to the deposited coordinates. In all data blocks shown below, the matrices 5-58 were edited out for brevity. In addition to these categories, non-crystallographic symmetry (NCS) symmetry operators are listed in the _struct_ncs_oper category. Please see the mmCIF dictionary for additional details and further information on the mmCIF format. In PDB format files, information about the biological assembly is given in REMARKs 300 and 350. REMARK 300 provides a free text remark regarding the biological assembly and may include specific comments provided by the author. REMARK 350, on the other hand presents all transformations (rotational and translational), both crystallographic and non-crystallographic, that are needed to generate the biological assembly. In addition to transformation information provided by the author, descriptions of potential assemblies that can be computationally determined are also provided when available. Author-provided and software-determined biological assemblies are marked appropriately. In the entry 3c70, REMARK 300 is a free text remark followed by REMARK 350 which includes the transformations required to generate the biological dimer from the deposited coordinates. In this example, the asymmetric unit is composed of a single chain (chain A). The biological dimer is generated from two copies of the asymmetric unit. The first copy is identical to the deposited asymmetric unit (note the identity operation in green). The second copy is generated by applying a crystallographic symmetry operation consisting of a rotation matrix (red) and a translation vector (blue). Note that this biological assembly is both author provided and software (PISA) predicted. In this example the deposited coordinates include two chains (L and S) that comprise the icosahedral asymmetric unit (1/60th of the complete virus capsid). REMARK 300 is a free text remark while REMARK 350 provides the transformations required for generating the icosahedral virus. Note: matrices 5 through 58 in REMARK 350 have been omitted here for brevity. The first matrix is a unit matrix and corresponds to the deposited coordinates. Since these are already given in the PDB format file, they are flagged with "1" on the right hand side of the matrix. 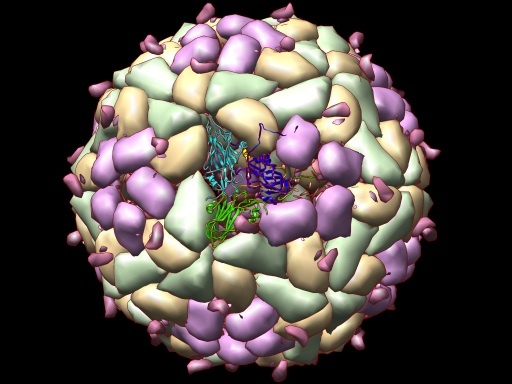 The other four matrices generate a five-fold symmetric sub-assembly of the virus. Note: Not all PDB or mmCIF coordinate files contain information regarding generation of the assumed biological assembly. 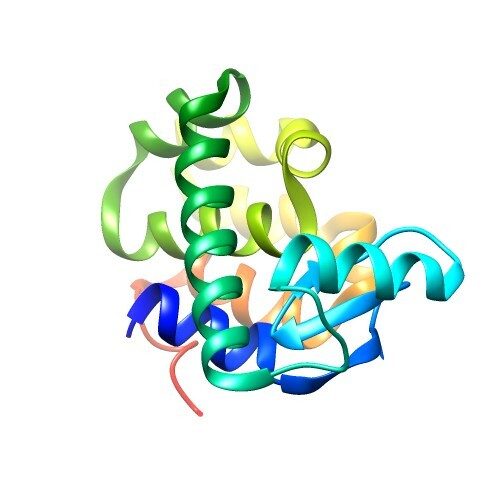 wwPDB-created coordinate files for the biological assemblies (or biological units) are archived in the directory ftp://ftp.wwpdb.org/pub/pdb/data/biounit/coordinates. These files can also be accessed from the RCSB PDB website. For any given entry, the default view on the Structure Summary page shows the biological assembly. The forward and backward arrows at the top of the visualization box allow toggling between the asymmetric unit and biological assembly images. In the case that there are multiple biological assemblies for the entry, the forward arrow can be used to browse through all of them. The biological assembly files can be downloaded from the "Download Files" menu options on the top right corner. For an example see entry 2bfu. 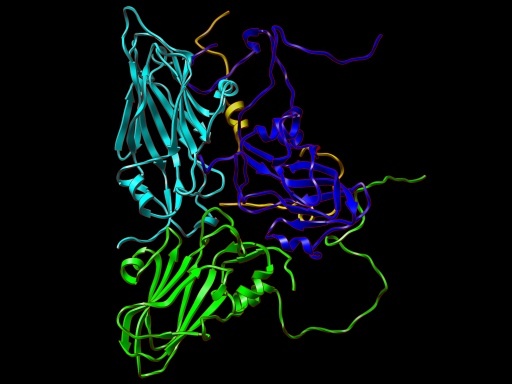 Specific databases, such as PISA1 may also be used to study the biological assemblies of PDB entries. 1 E. Krissinel and K. Henrick (2007) Inference of macromolecular assemblies from crystalline state. J. Mol. Biol. 372: 774-797.